Drop and drag functionality allows the user to create customized affiliate tools pages within minutes. Each affiliate tools page allows the affiliate to enter his id and automatically embed his id into every tool! Works with whatever affiliate link URL structure you define! Allow your affiliates to rebrand your pdf report with their affiliate link with the click of just one button! No extra programs to download… just one easy step and they are ready to email it to their mailing lists! Create affiliate tools pages for EasyClickMate sites that automatically embed the affiliate id. No fussing with php! Thank you for such a great product. Looking forward to putting it to immediate use for one current and several upcoming projects. I wish I had this 3 days ago but better late than never will work just fine! Wow Andrew! This is an incredibly useful plugin. Creating an affiliate resource page is vital to the success of a digital product if you plan to rely on affiliates to promote it for you. I just now spent some time installing it and setting up an affiliate page. It was very easy-to-use and the end result was very professional. I will be implementing this on my new products going forward. It just makes it too easy to create affiliate resource pages! I love the functionality of automatically inserting the affiliate links. Anyway, I just wanted to commend you on another job well done. I typically buy everything you put out because the quality is always top notch and always incredibly useful. This one definitely fits that description. To compliment our premium plugin and help you maximize the results of your affiliate program, we are also including two bonus video tutorials from none other than Jason Fladlien from Rapid Crush Inc.
100% No-Risk, 60-Day Money Back Guarantee! Try wp Affiliate Surge for 60 days. If you don’t like it, we’ll refund every penny. 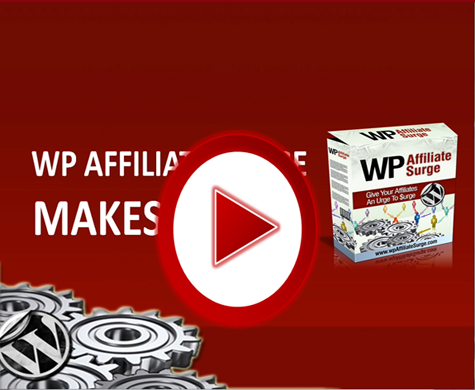 Obviously, we think wp Affiliate Surge is the best WordPress based affiliate tools generator available. But, we’ll admit we’re a little biased. That’s why we invite you to try wp Affiliate Surge for 60 days. If it doesn’t work like you had imagined, simply let us know and we’ll refund your full purchase price. No hard feelings. How does that sound? * This license entitles you to use the wp Affiliate Surge on an unlimited number of sites you personally own. Not for use on client sites.